For this example, I will use alcohol as an example drug, since it's legal and increases dopamine. Can drinking alcohol when performing unpleasant tasks, such as homework, cleaning, or laundry confuse the brain into associating those tasks with positive feelings, and thus increase the desire to perform those tasks, even in the absence of alcohol? For example, I noticed some of the songs I first heard of while drinking sounded particularly good, but also sound great when not drinking. Sure. Any introduction of a positive stimulus can reinforce any associated actions. However, alcohol is a depressant, and as such will negatively impact performance on activities such as homework, cleaning, or laundry, to name a few. Positive reinforcement and negative reinforcement increase the probability of a behavior that they follow, while positive punishment and negative punishment reduce the probability of behaviour that they follow...Positive reinforcement occurs when a behavior (response) is rewarding or the behavior is followed by another stimulus that is rewarding, increasing the frequency of that behavior. For example, if a rat in a Skinner box gets food when it presses a lever, its rate of pressing will go up. This procedure is usually called simply reinforcement. Aversive stimuli can drive drug seeking. Central to your question is the dopamine circuit of the limbic system (Fig. 1), being crucial to the reward circuitry in the brain. One notorious way of powerfully activating the reward system is through intake of highly addictive dopaminergic drugs like cocaine, heroin and amphetamines, but also alcohol, albeit less potently. They are so addictive because they evoke strong euphoric, hedonic feelings and the notorious 'crash' when their effects wear off. The euphoric state is a powerful positive reinforcer, the crash a potent negative reinforcer. Stressors negatively impact emotional state and can drive drug seeking by modulating the activity of the mesolimbic dopamine system. In rats this was tested by stressing them with the administration of the bitter compound quinine. Rats stressed in this way had a decreased dopamine tone in their limbic system. This was accompanied by an increased tendency to seek and use cocaine. This increased cocaine-seeking behavior resulted in increased dopamine levels in the limbic system, at least partially counteracting the stressful quinine shots (Twining et al., 2016). Fig. 1. 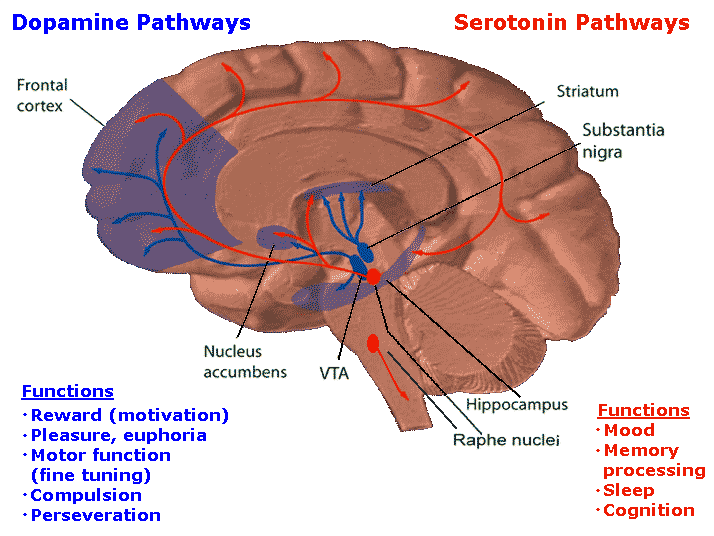 Dopamine pathways in the reward center of the brain. source: Lieff J. Not the answer you're looking for? Browse other questions tagged cognitive-neuroscience memory psychopharmacology or ask your own question.